It's fair to say that Obsidian has never really had a defining success. For years it's been the studio that gives us "almost but not quite" games - from the unrealised ambition of Knights of the Old Republic 2, to the scrappy mess of Alpha Protocol. Well, that reputation dies today. 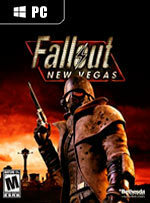 Despite the numerous bugs, New Vegas is a magnificent RPG, one that stands head and shoulders above its predecessor. More importantly, it's also the game that Fallout fans have been waiting for. Van Buren can finally rest in peace. 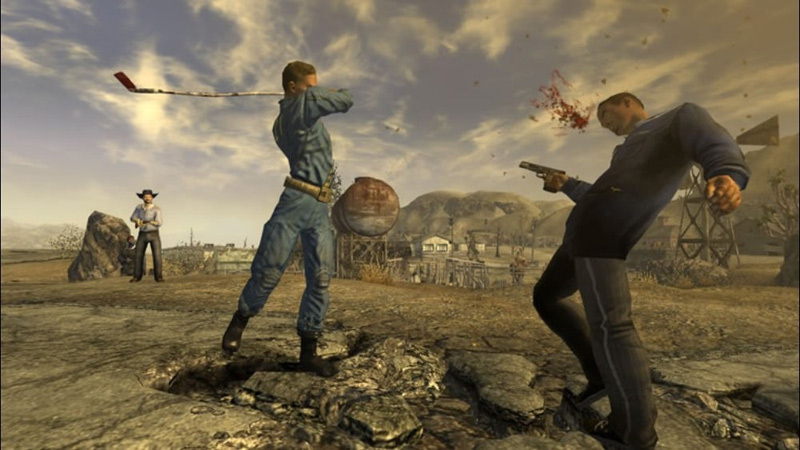 In New Vegas, the fun Fallout 3 formula is intact, with more polished combat, high-quality side missions, and the exciting setting of the Vegas strip. Unfortunately, the bugs also tagged along for the ride. If Obsidian and Bethesda had polished up the game by fixing the AI, improving the animations or even gotten it to run smoothly, perhaps it would feel less like a giant expansion of Fallout 3 and more like its own game. 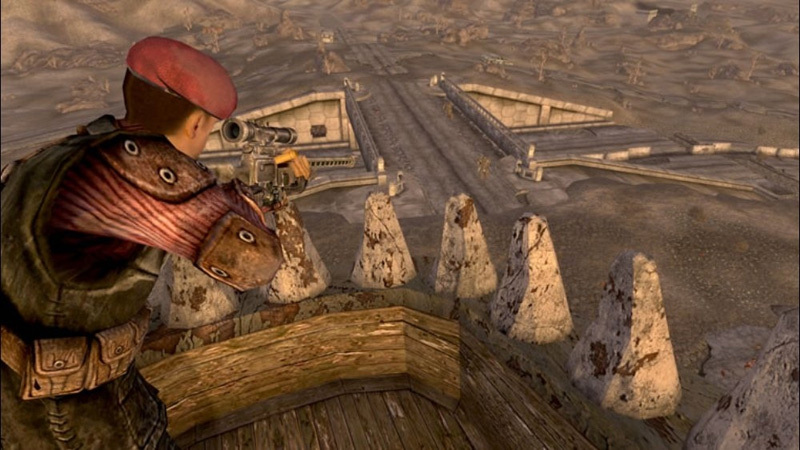 Fallout: New Vegas is an expansive and complicated RPG that encourages you to see and do as much as you can. This is an explorer's game, always lavishing new and interesting quests on you and giving you a lot of flexibility in how you approach many of them. It builds upon Fallout 3's mechanics in interesting and esoteric ways, making it a comfortable evolution to one of 2008's best games. There are things to see, sure, but the rewards aren't nearly as interesting in New Vegas. I didn't get as much out of heading for intriguing things on the horizon as I did in the previous game. With some new technology and the ambition to create a full world as compelling as the previous game's, it could have been wonderful. 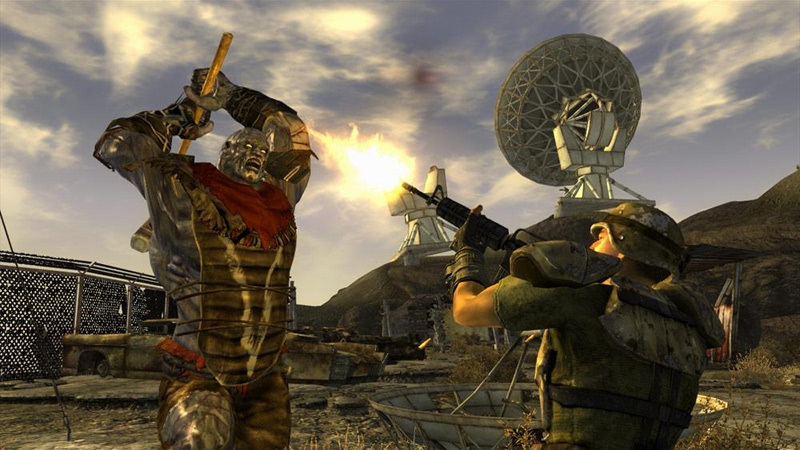 Fallout: New Vegas is the game that many wanted Fallout 3 to be. It's harder, more ruthless, better written and more morally ambiguous. It's a game we&#A;rray;ve been wanting to play for more than a decade, a real modern re-imagining of the Fallout series, complete with that deliciously black humour. But it's also more of the same, aesthetically and technically identical to Fallout 3, wonky facial animation and all. The glitches, whilst highly annoying, will hopefully be patched soon after launch, but again we can’t help but feel that as time goes on there’s less and less of an excuse for shipping games in such a state. Perhaps they’re paying the QA testers in Caps? This could have been a great game, so it’s a shame certain things are holding it back - still, it’s addictive, interesting, highly enjoyable, and so credit where credit’s due. A great addition to a great franchise, and a must have for fans and new comers alike. 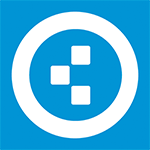 It's a roleplaying game that's unapologetic about forcing its players to roleplay, and the seemingly endless number of options means an enormous amount of replay value. 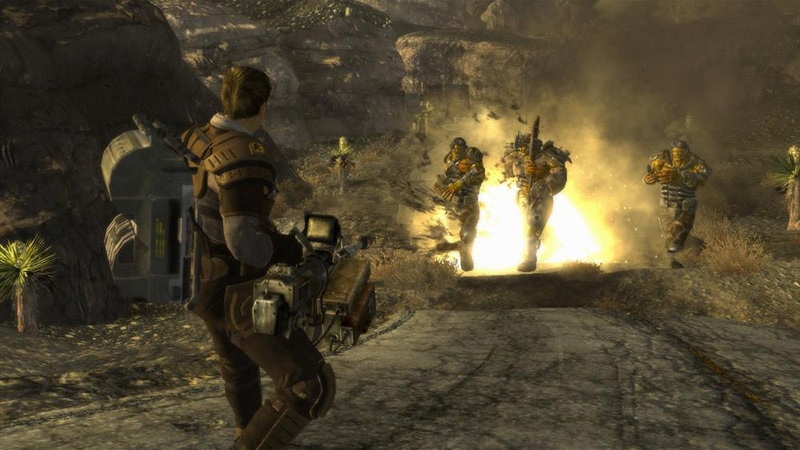 As a more in-depth RPG experience, suffice it to say that Fallout: New Vegas comes up trumps. Even so, Vegas represents a solid addition to Fallout canon. Those accustomed to investing hours examining endless story arcs, or searching vast environments for details will certainly appreciate Obsidian's efforts, even if newcomers may struggle to see what all the fuss is about. Si eres un jugador veterano, no esperes que el juego se transforme mágicamente en algo distinto, porque la familiaridad es inevitable tal y como está planteado este título. Hay que insistir que, además de las pequeñas mejoras introducidas, las mayores cualidades del juego no son inmediatamente obvias y tienen que ver con las historias y personajes que se van descubriendo por el camino. 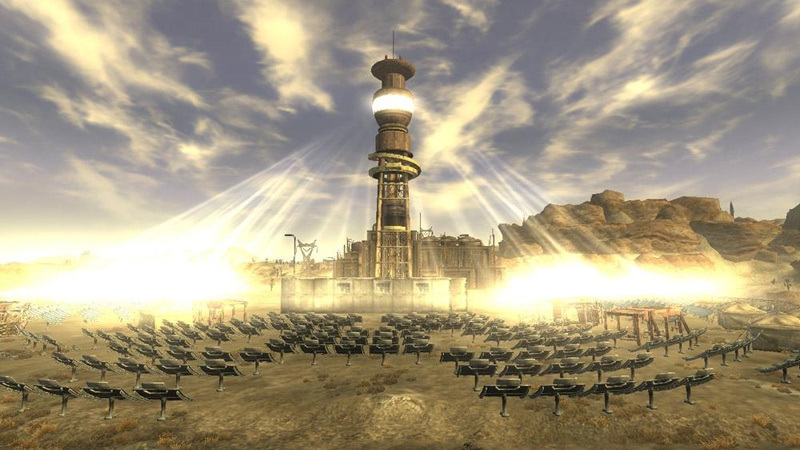 A l'instar d'un certain Fallout 2, Fallout New Vegas apparaît de prime abord comme une timide évolution de son prédécesseur, affublée d'un rendu visuel techniquement repoussant et artistiquement peu inspiré. Il suffit pourtant de s'y plonger avec suffisamment de conviction pour mesurer l'importance de chaque apport, à commencer par le système de réputation lié aux factions. Bien sûr, la réalisation misérable, flanquée qui plus est d'une VF navrante de platitude et d'une collection de bugs en tous genres, n'aide pas vraiment New Vegas à s'imposer comme le RPG post-apo ultime tel que l'auraient rêvé certains. Mais l'aspect "rôle" du jeu est tellement prédominant qu'on en vient à pardonner les errances techniques et le manque d'ambition artistique, pour savourer comme il se doit ce titre qui fait agréablement oublier Fallout 3 et ses gros sabots. Profond mais moche, le signe des jeux qui durent.